I don’t know about you, but warm weather makes me want a smoothie every day of the week. It’s so much fun to create a healthy (or indulgent) cup simply by throwing some things things in a blender. My sisters get nervous when I ask them to try one of my smoothie creations because they know my history of mixing some crazy concoctions in the blender. They have to ask about the ingredients to make sure the drink doesn’t have too many odd flavors. For instance, have you ever had a smoothie with hot sauce, cocoa powder and spinach? Yeah, I’ve been there. After about 10 years of experimenting, I may have grown out of that. Now I know what fruits and vegetable will go good together and what will be down right weird. If I do say so myself, I’ve become pretty good at smoothie creations. I usually don’t use a recipe, but sometimes it’s helpful to see them any way. I wrote the one below last week after throwing some stuff together and then made it again based on the recipe. If you love chocolate, bananas and strawberries, you’re sure to be in good company with this blend. It’s simple and delicious, making it an easy smoothie to make even in the morning rush. What’s great about this Chocolate Berry Smoothie is that it uses common ingredients that can easily be substituted, depending on your preference. Almond butter can be substituted for peanut butter. It will have a slightly different taste and consistency, but still taste great. The yogurt and milk can be substituted as well. If you want a dairy free smoothie, skip the yogurt and include 1/2 cup of milk substitute such as almond milk or soy milk. Really all you have to do is throw this all in a blender. It’s that simple, people! The order doesn’t matter much, but personally, I like to add the frozen ingredients last after mixing everything else. Blend to your heart’s content. I like to blend the first half smooth and keep the frozen stuff slightly choppy. So, what do you think? Let me know if you try this smoothie or have a favorite of your own to share. Awesome Erin! 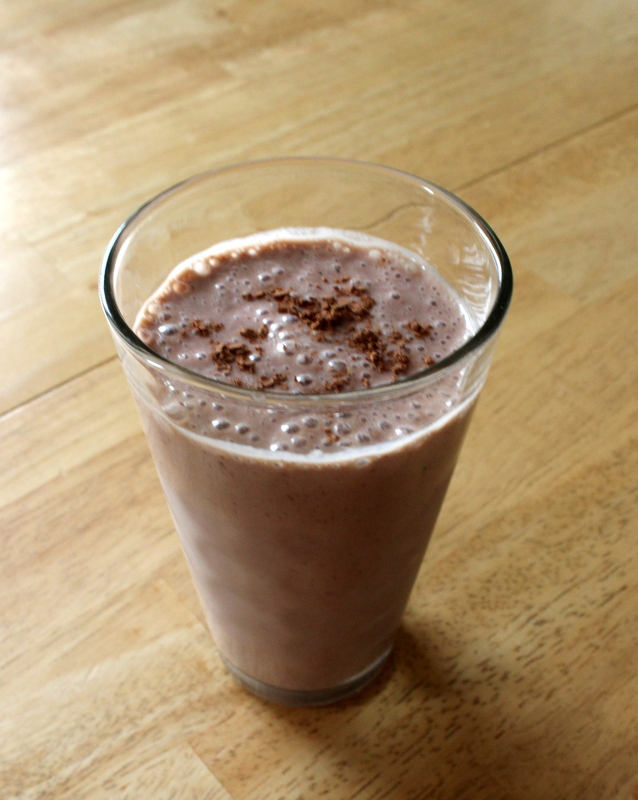 I make a similar smoothie and use coconut milk instead of dairy, and chocolate protein powder instead of cocoa powder! Thanks Colby! That sounds good too!